Four years ago, Cody Warren came to Augsburg with the certain sense that he was called to become a pastor. A volunteer opportunity created in Cody a desire to learn more about tax accounting, and it also opened his eyes to new possibilites for exploring his vocation. At Augsburg, Cody majored in Accounting and Religion, was involved with campus ministry, was an orientation leader, worked with academic advising, and was part of the Augsburg accounting and finance club. And in President Pribbenow's first year, Cody got to trade places with him for a day. He says Pribbenow reversed all his decisions from that day. 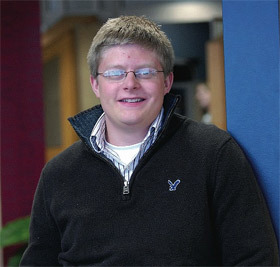 What follows is Cody's senior chapel talk on taxes, vocation, and Bonhoeffer. If you are a graduating senior and would like to share your Augsburg story with us, please email wheelerw@augsburg.edu. We may certainly rejoice today! Tax Day has officially come and gone. Yes, the dreaded time of year where millions added up their wages and other income, subtract deductions and personal exemptions, take advantage of tax credits, and well the list goes on. Many of us find taxes burdensome, confusing, and just plain annoying. But, I LOVE THEM. I simply cannot get enough of tax season, and so while some of you rejoice, I mourn. It is with great fondness that I remember the first time I filed my 1040-EZ—I telefiled—no longer an option. As soon as I had received all the required documents, I completed the forms, sharpened my pencil and pulled the chair up to the phone, entered the numbers, and like magic, the computerized voice confirmed my initial calculations—I was to receive a refund! Oh, what joy, I was getting money from the government! Today, I am much wiser and understand more of the intricacies of the IRC, or Internal Revenue Code, for those non-tax-junkies, but the power of a refund is still magical for those who live in poverty. My renewed fascination with the tax code began when I volunteered with AccountAbility Minnesota, a non-profit that prepares tax returns for low-income individuals at no cost. I was amazed at the impact a simple tax return could have on a family. Many of the people I assisted received a refund of almost 1/3 of their annual income. This is much needed money to pay for housing, health care and food. It was like manna from heaven thanks to the Earned Income Tax Credit. This started a desire to learn more and continue to assist others. But, this desire also renewed a continual personal battle I face—I am an eternal planner. I make to-do lists and develop hypothetical budgets (of course, fully researching ALL variables). I always seem to find myself two steps in the future and 1 step in the present. My first semester at Augsburg I was presented with the "v-word"—vocation. As you may imagine, this only intensified my planning efforts. Not only was I planning for fun, I was planning for my VOCATION. When I first came to Augsburg, I was 110% sure that my call, my vocation, was to be a pastor. So, fast forward to AccountAbility Minnesota and enter crisis mode for Cody Warren. Could it be? Could my vocation actually change? Am I really called to be a pastor? Or maybe a tax accountant? I was lost, confused, and disheartened. Luckily, I was introduced to the works of Dietrich Bonhoeffer and now I am saved. I am exaggerating, a little. For the past year I have been reading, writing, and at times it feels like breathing Bonhoeffer. Through my research I have come to appreciate a broader, more dynamic understanding of vocation that Bonhoeffer speaks to in his manuscripts. Bonhoeffer writes about vocation as the place of responsibility in the world. As Christians we have the responsibility to serve our earthly roles, like career and family. But we also have an ethical responsibility to serve our neighbor and take up the cross of Christ. When these responsibilities meet, liberated by grace, we find our vocation. And this, for me, this new understanding was life changing. Not only can my vocation be expressed as a tax accountant, my understanding is now expanded to know that this could change many more times in my life. My original understanding of vocation was too limited—it did not take into account the dynamic nature of faith or vocation. Maybe one day I will be a pastor, or a professor, or even a dad. Vocation is not about creating Excel spreadsheets, it is about faith. Vocation is lived in the fullest through responsibilities but also through an act of faith—faith in the sense that we are called by grace to the responsibilities of Christ and the world. Our vocations may by dynamic, forever changing, and forever shaped by the call of Christ to serve.